I used to never wear navy because I thought it wouldn't go with anything, but it pretty much goes with everything! 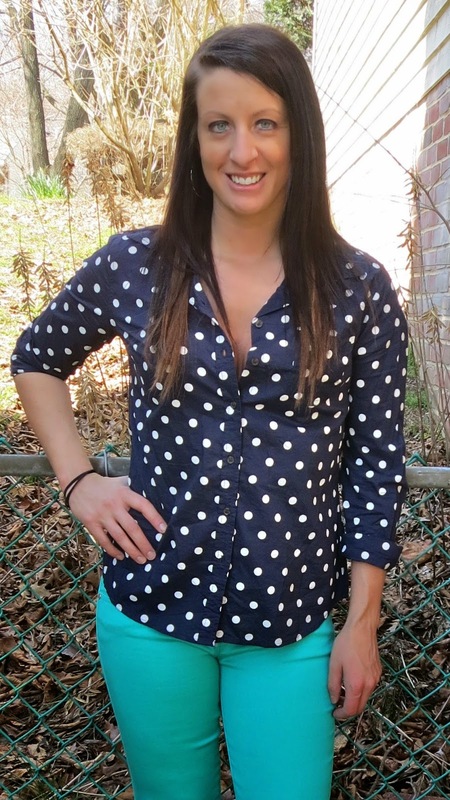 That's why I chose this polka dot navy top to go with my new mint skinny jeans. The shoes are slip on and soooo comfy! I found them for $20 at Target! Blouse - Target; Jeans - Celebrity Pink Jeans; Shoes - Target. I wouldn't have thought to pair mint and navy together. Looks good. Love the polka dots! Thanks Cate! I used to never want to try things like this! Glad i have changed my ways! Polka dots AND teal in one outfit post?!? It's a dream come true!! I do love teal :) Thanks for the comment! Love these colors together!! Newest follower! Thanks Jordyn! Ill check out your blog as well!